A red-eared terrapin swims in an aquarium. There is a device attached onto its shell. The device, with five LED lights, sticks out from above the head of the terrapin. When one of the LED lights flashes, the terrapin swims in the direction of the flashing light. The reward is a gelatin pudding, which comes out through a tube leading to its mouth. The terrapin continues to move in this manner and succeeds in following the designated path. The device attached to the terrapin’s back is called a parasitic robot. The parasitic robot system, which imitates the relationship between parasites and hosts, controls the direction of movement of the host turtle. This system is impressive in that the host turtle is controlled by a device the size of a human palm, without involving a human controller or having chips inserted into its body. Dr. Dae-Gun Kim (Computational Mechanics and Structural Systems Laboratory, supervised by Phill-Seung Lee) published the results of his study in the Journal of Bionic Engineering last May. Soon enough, his study gained international fame thanks to coverage by major news outlets such as The New York Times, and the parasitic robot was invited to be showcased in an exhibition at London’s Science Museum. Dr. Dae-Gun Kim, who joined the graduate program in 2011, did not imagine that he would become famous for the hybrid animal-robot interaction system. Because the laboratory that Dr. Kim belonged to specialized in computational mechanics, research on hybrid animal-robot interaction was a new challenge. He began his study with five terrapins and a simple idea. How did the terrapins come to live with parasitic robots? “In the past, there were attempts to plant chips in the bodies of fishes or insects, and to make robots similar to animals. Our study is the first to control the direction of movement of terrapins. It is also the first as an independent parasitic robot system capable of animal control,” said Dr. Dae-Gun Kim on the significance of the study. The parasitic robot system was developed by imitating the relationship between parasites and hosts in nature. The setup is simple, entailing the main body, LED lights, and a feeding tube. The robot cannot move on its own as it has neither a motor nor wheels. It moves by borrowing the body of the host terrapin. The robotic body is equipped with a terrapin control program, which guides the terrapin using flashing LED lights. Rewards are given whenever the terrapin moves in the specified direction, and its accuracy improves with repeated training. In accordance with Skinner’s reinforcement theory, the terrapin underwent stimulus-response training for a period of five weeks. Dr. Kim said, “The terrapin was trained by the robot, not humans. The idea was to develop a device capable of training animals on its own after being attached to the host animal.” Because Dr. Kim majored in electrical engineering at the undergraduate level, the parasitic robot system was a new challenge, and so was research involving animals. As such, he had to first acquire knowledge on animal cognition and behavioral science. He attended behavioral science classes offered by the Department of Biological Sciences and read related publications. He said, “It was difficult to get acquainted with behavioral experiments and ethical regulations, but choosing the road less taken turned out to be more fulfilling.” Research on turtle control has gone through several phases. In 2013, he worked together with Cheol-Hu Kim to study the remote guidance of untrained turtles by providing a visual stimulus to control their movement. They used a semi-cylinder to block the turtle’s view and succeeded in controlling its direction of movement. In 2016, they collaborated with Professor Sungho Jung of the School of Computing to control the turtle via a brain-computer interface. 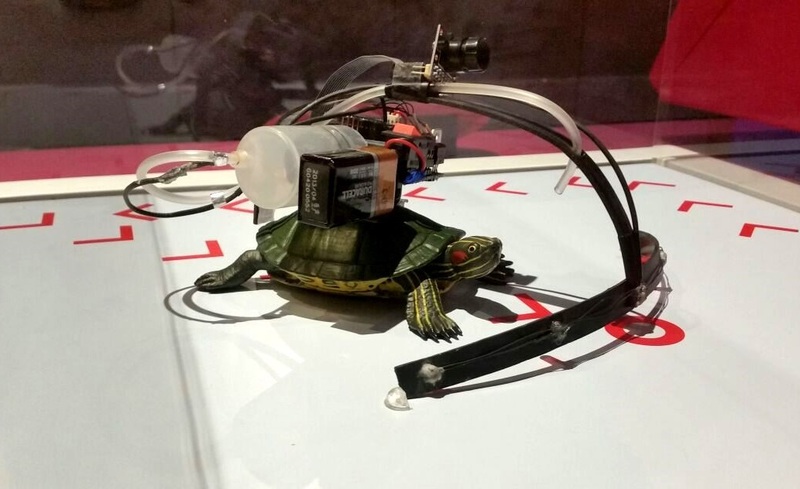 A terrapin and the parasitic robot system on display at London’s Science Museum. The parasitic robot system is also consistent with trends associated with the age of the fourth industrial revolution. “The convergence of humans and machines falls under the umbrella of the fourth industrial revolution. This is one factor contributing to the appeal of the hybrid animal-robot interaction system.” According to Dr. Kim, animal control research first began with Robo Rat, developed by researchers at the State University of New York to serve military purposes. Technological advancements have helped to improve the standard of animal cyborgs. Amidst the growing interest towards the convergence of humans and machines, a new company specializing in insect cyborgs was recently launched. Elon Musk, the founder and CEO of SpaceX, established Neuralink to create a network of all human brain cells. An explanation of the parasitic robot system at London’s Science Museum. Dr. Dae-Gun Kim: Since high school, I have dreamed of creating a cyborg. It’s necessary to have researchers conducting mainstream research, but it is just as important to have others taking on challenges that have never been addressed before. In 2011, when I first started out, no other laboratory in Korea was involved in animal control. I believe hard work and dedication lead to good results, even in a totally new field. New attempts help pave the way to a better future. Prof. Phill-Seung Lee: I thoroughly enjoyed this study. It’s also meaningful that the students were were the ones who took the initiative. I watched from the sidelines, and tried not to give them any pressure. Now, Dr. Dae-Gun Kim is ready to stand on his own.